Orphaned at a young age, Claire has been raised by her beloved aunt and uncle, along with cousins she views more as siblings but she feels the loss of her parents keenly and her deepest wish has always been to create a family of her own. She was deeply in love with her first fiancé but he died before they could marry. By the time she becomes engaged to Lord Paul, the ton's whispers that Lady Claire must be cursed have turned to shouts and Claire has long since given up on love. After a history like that, when Alex steps in to rescue her from broken engagement #4, I could fully understand her reticence and when her heart becomes engaged, her fear. I found Claire to be a fascinating and complex woman; a blend of admirable strength and heart-wrenching vulnerability, impacted by the horrific events surrounding her parents' deaths in ways she's unable to share or move beyond. Alex is a typical man of the times: arrogant, single-minded, and certain that his way is the right way. His heart is in the right place when he sets out to avenge his sister but he goes about it in the wrong way and realizes almost immediately that he's put an innocent person in the middle of the fray. Unfortunately, that innate arrogance keeps him from fixing things until the damage is done. While there were several instances when I wanted to toss him off a cliff or whop him upside the head with a frying pan and yell "What have you done?," I found myself unwilling to give up on him. MacGregor gives him a worthy black moment and deliciously good groveling (he deserves it) before his happiness can be achieved. This is Janna MacGregor's debut and the author shows great promise. As the first book of a new series, this story has many characters and the beginnings of what will likely be future storylines. At times it felt a bit cluttered but that is often the case with a first book. Alex and Claire are complex characters with immediate chemistry and plenty of sizzle in the bedroom, but both have some growing to do before enough trust is built between them to forge a lasting relationship. The secondary characters add flavor to the journey and I'm looking forward to what MacGregor has in store for some of them. I'm especially intrigued by Lord Paul, the villain of this book. He reminds me a bit of Sebastian, Lord St. Vincent in Lisa Kleypas' Devil in Winter in that his actions are inexcusable but glimpses of inner pain - and goodness - make me believe he might be redeemable. Time will tell. 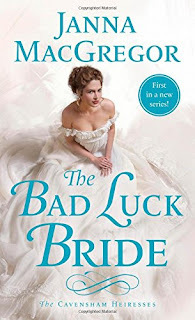 If you're looking for a light, frolicking romance, this may not be the right book for you but if you want to sink your teeth into a meaty story, with twists and turns, great depth of emotion, and a happy ending that is worth the heartache it takes our hero and heroine to achieve then I encourage you to give The Bad Luck Bride a try. I've already marked my calendar for book #2, The Bride Who Got Lucky, scheduled to be released October 31st. I love finding new Authors. The review,title and cover are great. I would love to read this. I've not read her as yet but it sounds like the kind of story I enjoy! This is her debut, catslady. I'm already looking forward to book #2! Yes! I would love to read this! I think you'd enjoy it, Linda! It's sounds like some of the secondary characters were just as intriguing. Your review has hooked me. After reading your comment, "While there were several instances when I wanted to toss him off a cliff or whop him upside the head with a frying pan and yell "What have you done?," I am looking forward to seeing how Alex is able to redeem himself! Hope you enjoy it as much as I did, cheryl! It looks like an emotional story which I enjoy very much. This is her first book, Natasha. I'm looking forward to reading more from her. It's always nice to discover new authors. Thanks for the intro post and giveaway. You're welcome! Hope you enjoy her book. Omg you got a print copy at BVW17!? Jealous! Of course I'm going to go get my print soon but what a great surprise. This sounds like my cup of tea. Thanks for a great review! You're welcome! Hope you like the book. Sounds good. Would love to read it. This novel sounds captivating and unforgettable. Your review captured my interest as well as the wonderful storyline and the characters. I love light frolicking romance! How exciting to have a debut book! Janna MacGregor has hit it out of the park with her debut novel. I couldn’t put it down! Her characters are passionate and complex. The story has a depth and richness to it that I haven’t seen in a while. She creates an intricate plot that is as intelligent as it is seductive. It kept me on my toes the entire time. I can’t wait for the next book in the series. Well done!